Moving forward, it's time to attach the lining to the jacket. Unfortunately, I don't have many photos of this process. I was so focused on the sewing that I totally forgot about the camera! In all honesty I was dreading this step, but it ended up being much easier than I anticipated. 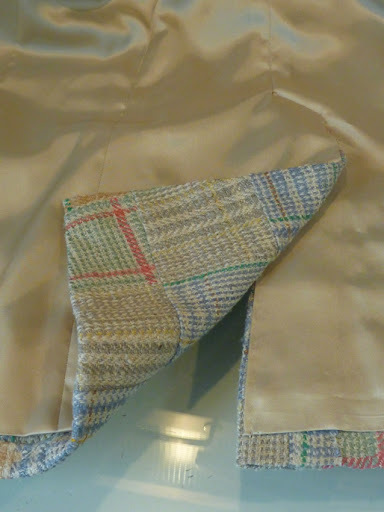 After placing the right sides together, the jacket and lining are basted together with a line of basting stitches placed down the center of the twill tape. The machine stitching is placed just next to the tape. Cabrera suggests 1/16 " away. I just went very slowly with this step, making sure not to catch the edge of the tape. 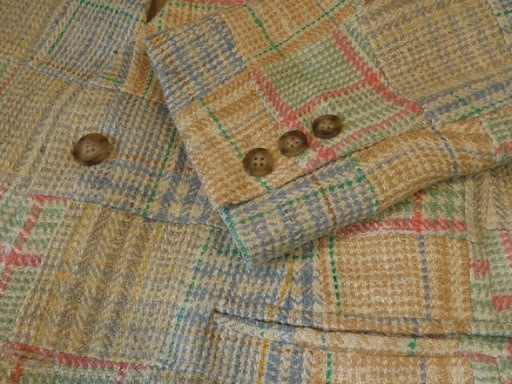 The seam is then pressed open and the lining / facing is turned to the inside of the jacket. From this point the jacket is finished with handstitching. This is my preferred way of hemming, even though it just looks like a huge mess. 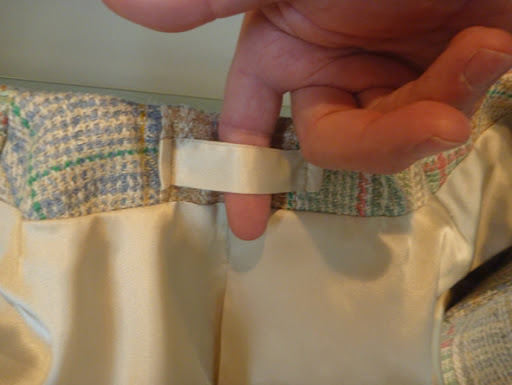 The hem is 2" deep, so a bias strip of pocketing 2 1/2" wide is placed into the fold of the hem and sewn in place. 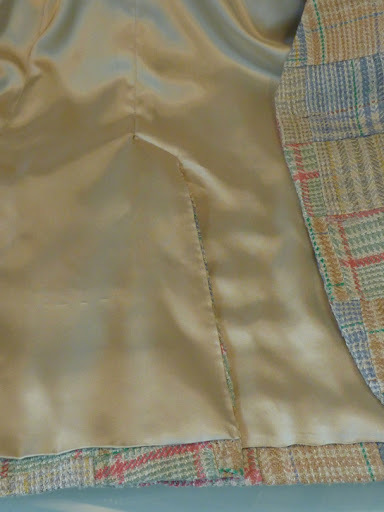 I backstitched the pocketing to the folded up hem along the line of the pins. (The stitches just don't show up in the photo.) The actual hem stitch is done between the pocketing and the body of the jacket. It's easiest to do this with the hem facing away from you, as shown in this photo. Sewn this way, your hem will be totally invisible. Plus, the hem gets a little extra "oomph" from the added muslin strip, and a little extra body is always a good thing in my opinion. 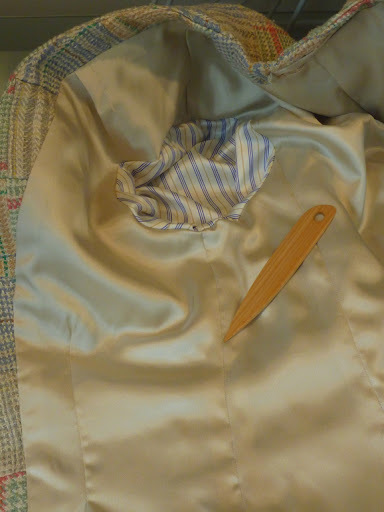 The disadvantage to the way I've lined this jacket is that the lining isn't anchored to the body of the jacket anywhere. It's just hanging inside. To correct this I've placed a line of invisible stitches "in the ditch" along the front / side seam. The point turner is pointing to the seam. 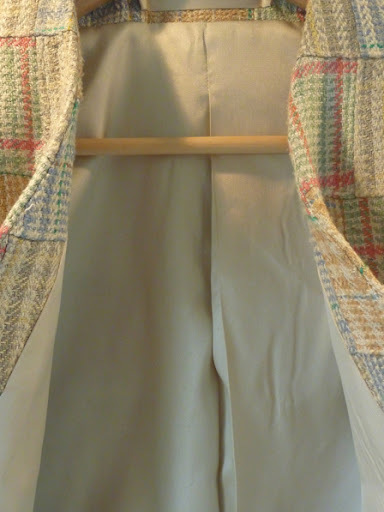 With the seams of the jacket and the lining aligned over each other, a row of invisible stitches is placed starting at the underarm and worked down to the top of the pocket. Problem solved. Now the lining isn't shifting around inside the jacket. The facing has a similar problem, especially on this jacket since there's no lapel. There's nothing anchoring it, so it wants to roll out. If I were sewing the entire lining by hand, the facing would first have been cross stitched to the inside of the canvas, and the lining would have lapped over the facing. My job is to replicate that. Fortunately it's not difficult. 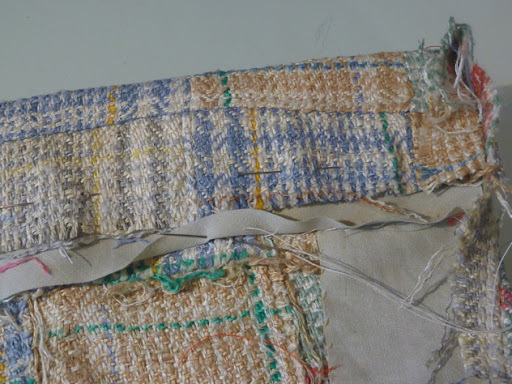 The facing is pressed into position and then a line of invisible stitches is placed "in the ditch" down through the facing / lining seam. These stitches must catch the canvas underneath, but not go through to the front of the jacket. It's easier to do than it sounds. Still, I keep checking the fronts frequently to make sure I'm not accidentally stitching too deep. So, there have been a couple of extra steps. But overall, I think it's been much easier than sewing the lining completely by hand. Now that the lining is better attached to the jacket, I proceed with the vents and hem. Is there a magic answer to lining? I wish! I just work methodically along. I find it easiest to work the lining from two directions, alternating down the vent and across the hem. It has a way of coming together eventually. It just takes patience and a willingness to fiddle with it until it does what you want it to do. 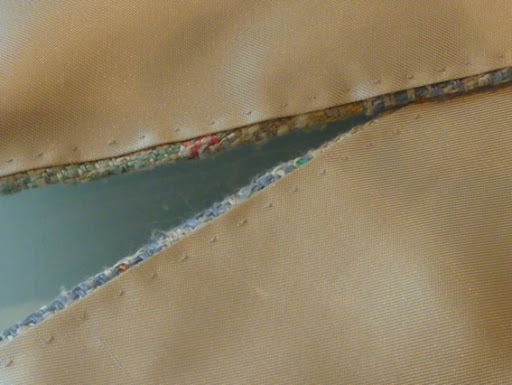 I run the lining close to the edge of the vents and finish it off with pick stitching. I think it's an elegant way to finish the lining. Plus... it's really easy and fun to do! This is the back pleat after the basting is removed. Lots of wearing ease here. I added a locker loop to the back neck facing. This helped give some much needed structure to this area. In retrospect I should have interfaced the facing. The last minute pocketing that I added to the lining just isn't substantial enough. A heavy weight fusible would have been perfect here. Ah well, next time. It wouldn't be sewing if we didn't have some regrets, right? It's how we learn and progress, making the next garment just that much better. I wasn't wild about the buttons that came with my B Black & Sons "jacket packet". Other than that, the packet was fantastic. Two thumbs up! There was nothing skimpy about it. I have a nice chunk of both pocketing and lining left over. Unfortunately the color of the buttons just didn't work with my fabric. I also thought they were a little too shiny. This was the best I could do at JoAnn's in a pinch. Someday I hope to find something a little lighter, but these are fine in the meantime. So this brings me to the end of my tailoring geekery. Thanks for sticking it out with me! I hope to model the new jacket soon. Wow. Just love that lining. It's as stunning as the jacket exterior. Can't wait to see it modeled. Looks fantastic! Can't wait to see it on you. can't wait to see it, glad you took the time to post all the nitty gritty! Holy guacamole! This looks incredible! Lovely, stunning, beautiful, etc etc. Job well done. oh that is so beautiful . Well done . I am making Coat number 5 for my son Pete. I was wondering if you could help me . I dont read japanese but have pretty much worked out what is going on I think . However on the instruction pages they add on varying amounts of seam allowance . This seems rather odd to me unless they are actually saying you should sew it all with the same seam allownace and he variations are added ease??? I am considering just not adding the seam allownace to the pattern pieces and then doing thread tracing around each piece so that I can add my own seam allowance . This means that I am not using the distance from the edge as my stitching line which given it varies so much seems rather pointless anyway. This is what they do in couture . Do you have any suggestions here . You obviously have this quite well sorted judging by your results!! Marianne . Hi Marianne, I've gone back to look at the cutting layout for #5. I would make all the seam allowances 1.5 Cm and all the hems 5 Cm. I would ignore the odd cut outs at the armholes. On page 61 working from left to right. The pocketing, use 1.5. Next is the sleeve lining. Add on extra material at the armpits as I did in my previous post. I would also add material at the hem. It's easier to cut off excess than not have enough. Next is the body lining. See how the center back seam is doubled to make a tuck. (It gets sewn and formed in step 7). Cut both back linings the same with the extension for the vent. DO add some extra at the top of that extension, you will need extra fabric to fold down there. Again, I would add a hem. Also make a small clip at the bottom to mark the fold line. This will really help when you finish off the vent. OK, moving to the right top. The seam allowance on the collar is 0.7 Cm. I'm pretty sure I used the usual 1.5 and trimmed it after sewing. BIG WARNING HERE, I could not get the collar to fit. A sewer in England and I were working on this coat at the same time, and we both agreed that the collar was at least 1/2" too short. You will want to muslin it. I'm not sure why the facing allowances are narrower. I say stick with the 1.5 and trim them after everything is sewn together. The sleeves and welts are pretty straightforward. For some reason the center back seam has been increase to 2 Cm. I'm not sure why. Extra strength? Funny that it doesn't increase on any of the other coats in the book. I think you can safely stick with 1.5 Cm. I hope this has been helpful. Thanks for that I am sure you have prevented significant gnashing of teeth!!! it's a work of art ! thank you for taking your time to document this so well. This looks great! I'm so impressed with the detail and thought you put into the project! What is a "locker loop"?? How does it give the neckline structure? The loop is added so that the coat can be hung on a hook. Men have to do that a lot it seems. I centered the patchwork at the back so I was able to attach the loop by stitching in the ditch through all the layers. It should help prevent stretching. What a masterpiece and with such unusual fabric to make it a challenge. Your photo steps are superb and your hand sewing impeccable...like the others...can't wait for a photo of you wearing the jacket...wow like you could wear any color shirt in your wardrobe and it would work! Thanks for taking us all on this journey with you!